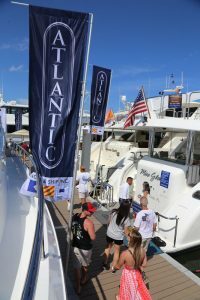 Palm Beach International Boat Show 2018 Wrap Up! : Atlantic Yacht & Ship, Inc. The Palm Beach International Boat Show 2018 wrap up! The weather was absolutely gorgeous during the entire show. We had clear skies, cool weather and sunshine. We had a line up of vessels that caught the eyes of attendees. The vessels ranged from day cruisers to sport fish to motor yachts. The show generated a ton of leads and business deals for Atlantic Yacht & Ship, Inc! The Arkup model drew attendees to the front of the Atlantic Yacht & Ship, Inc booth. The Arkup is a 100% Electric Solar Livable Yacht. As comfortable and safe as a house onshore, Arkup livable yachts can cruise silently in the bay or allow you to live stationary in a downtown marina. The vessel is completely stable when lifted up on its hydraulic spuds to protect you from the effect of waves and tropical winds. Just relax and enjoy, you can live in the view! Contact Bryan Carter at Atlantic Yacht & Ship, Inc for more information. As we say goodbye to the Palm Beach International Boat Show, we say hello to the Yacht Walk at Harbour Towne Marina. Check our Events Calendar for more details. The perfect opportunity if you missed the boat show or need a second look at a boat. We hope to see you there!